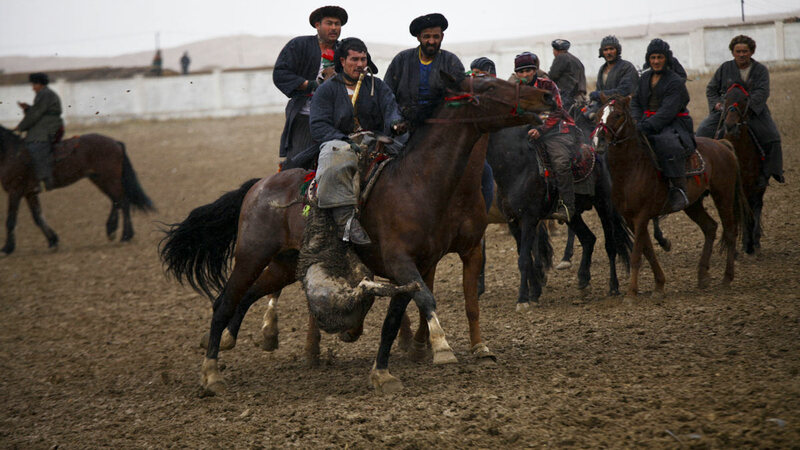 Afghanistan's national sport is like polo, with a headless goat. 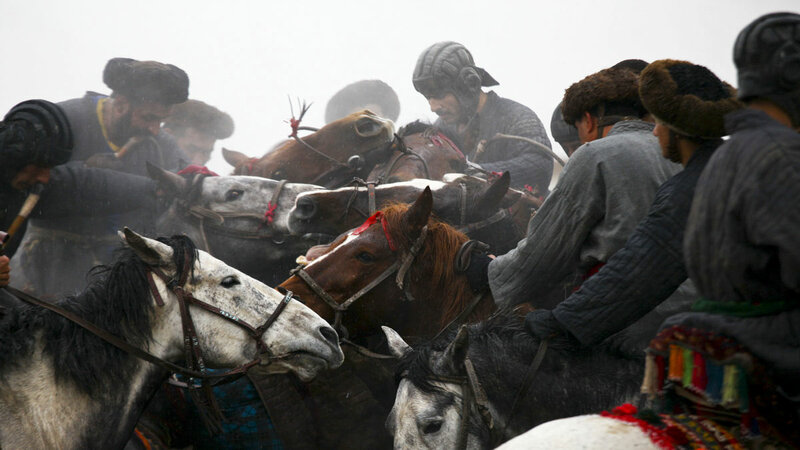 If you think about it, most American sports involve an animal hide. Baseballs, basketballs and footballs are all made with leather. 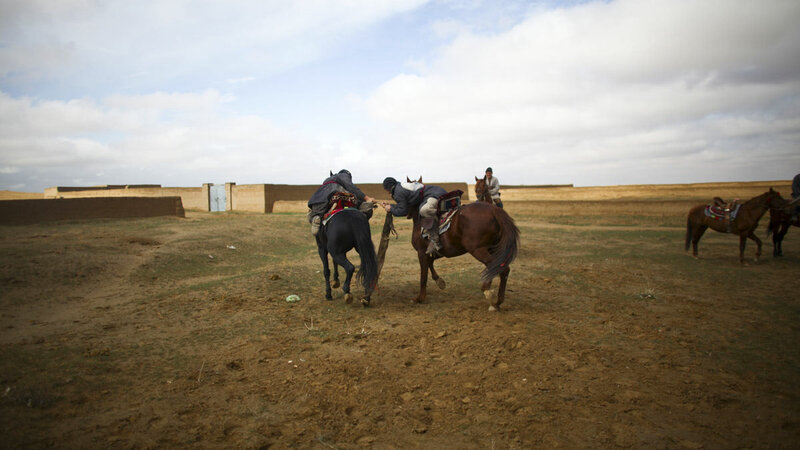 In Afghanistan, they don’t just use the skin — the game ball is a whole goat. 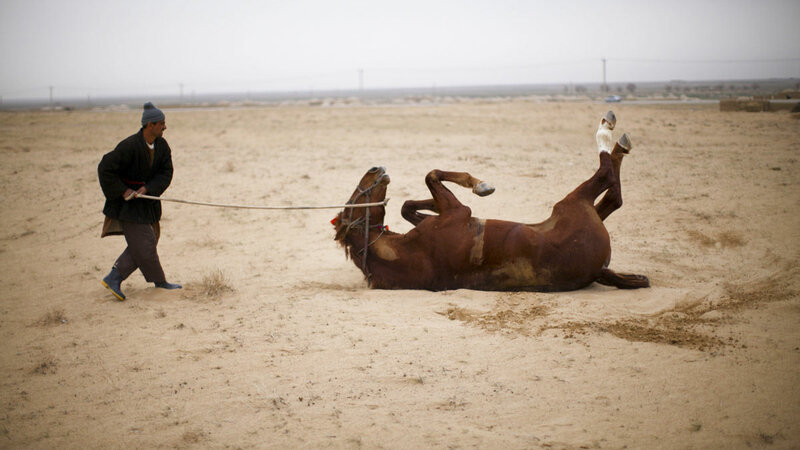 Minus the head and hooves. 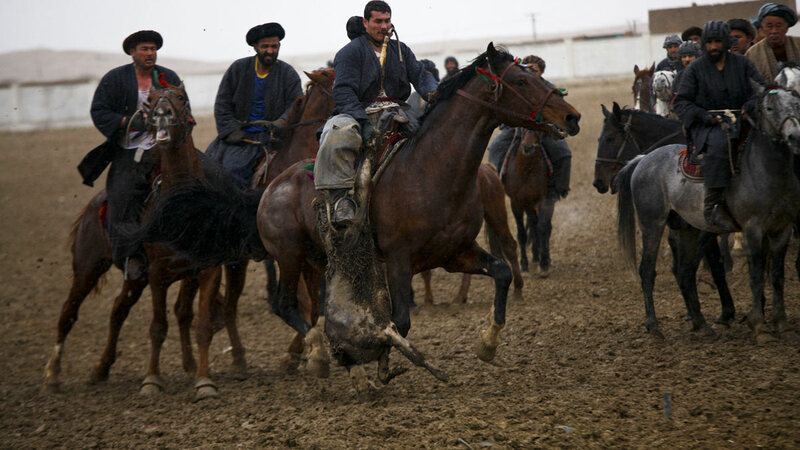 Buzkashi, the name of Afghanistan's national sport, translates into something like "goat-grabbing." 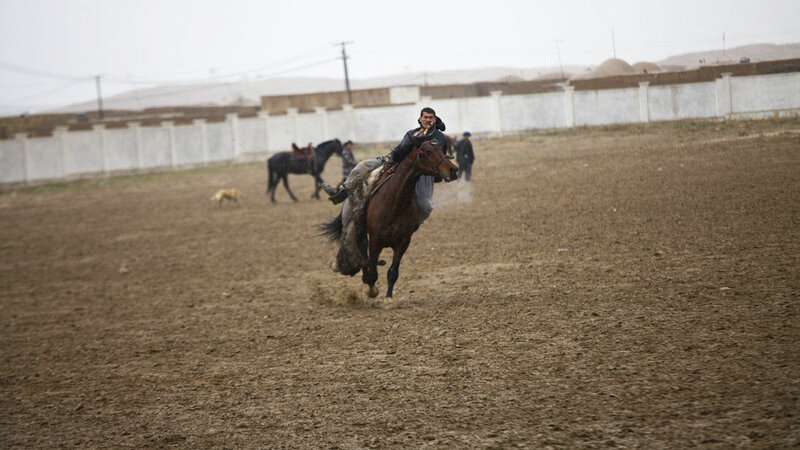 That's the object: Grab the headless, disemboweled animal carcass (sometimes a calf), circle the field and deliver it to the goal. 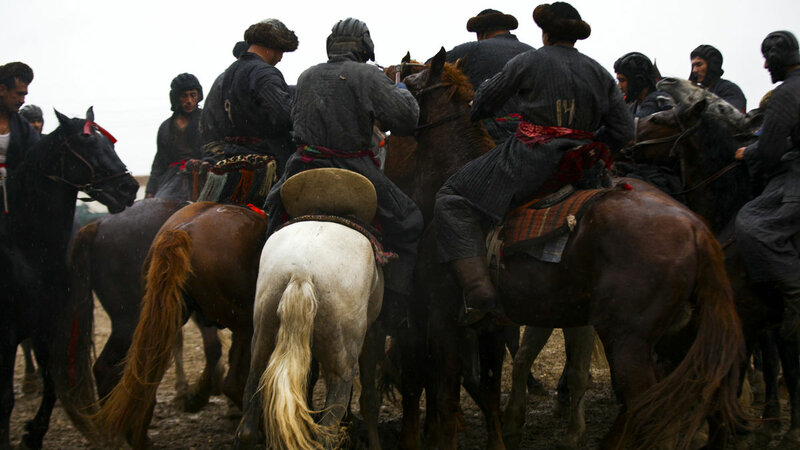 It originated among the Turkic people of Central Asia centuries ago, and for generations they’ve been passing down the game, and the goat, relatively unchanged. 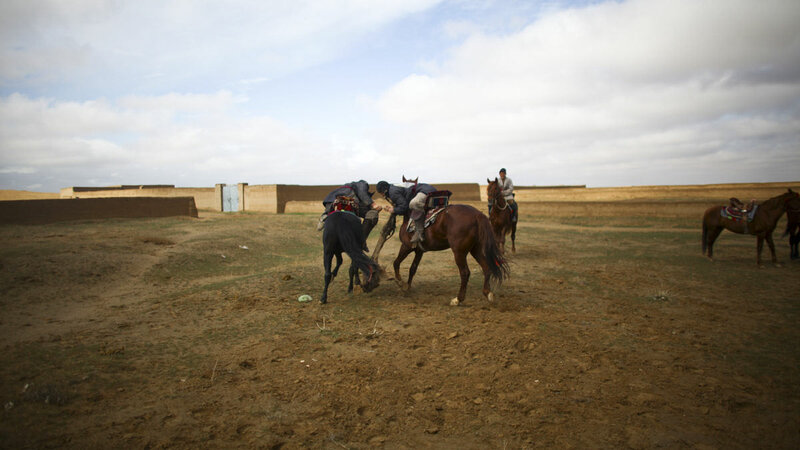 It’s more than a game; it’s a part of the fabric of Afghan life. And its popularity has never waned. 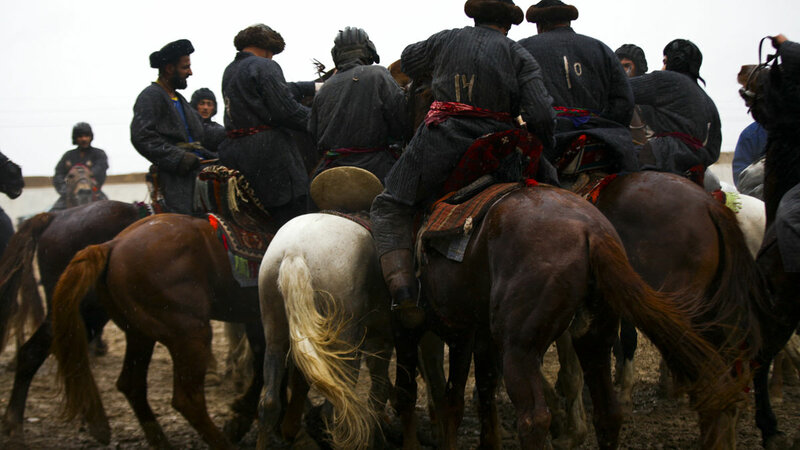 In the northern Afghan city of Sheberghan, you can catch a game after noon prayers most Fridays in the winter. 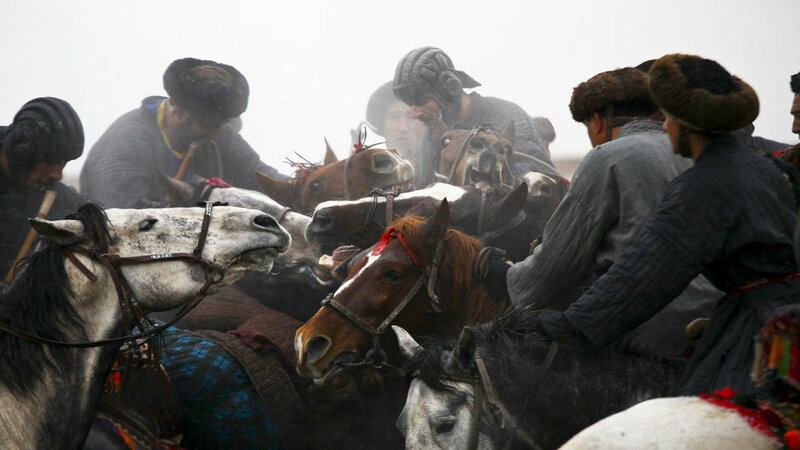 That's buzkashi season. 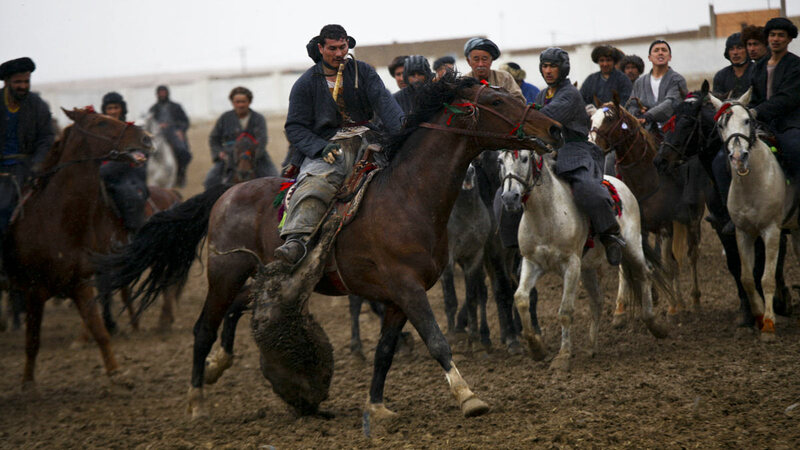 Like any Western sport, buzkashi draws a huge crowd of passionate fans — and involves big money, at least by Afghan standards. 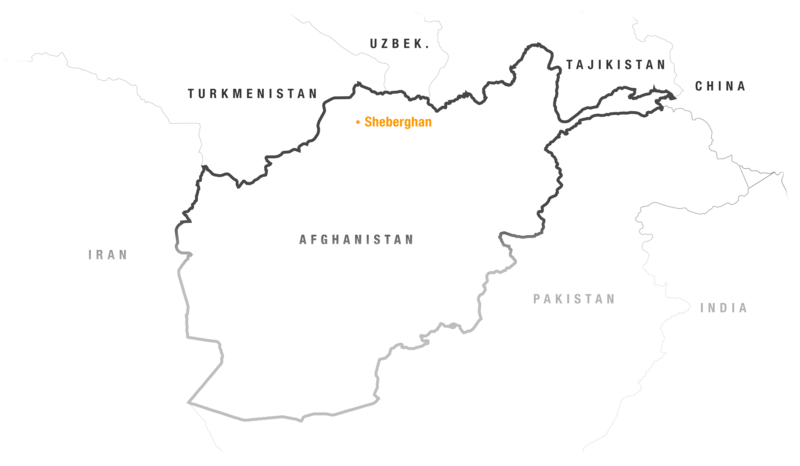 In fact, the match we caught was sponsored by Gen. Abdul Rashid Dostum, who has long had a reputation as a ruthless Uzbek warlord [What?] 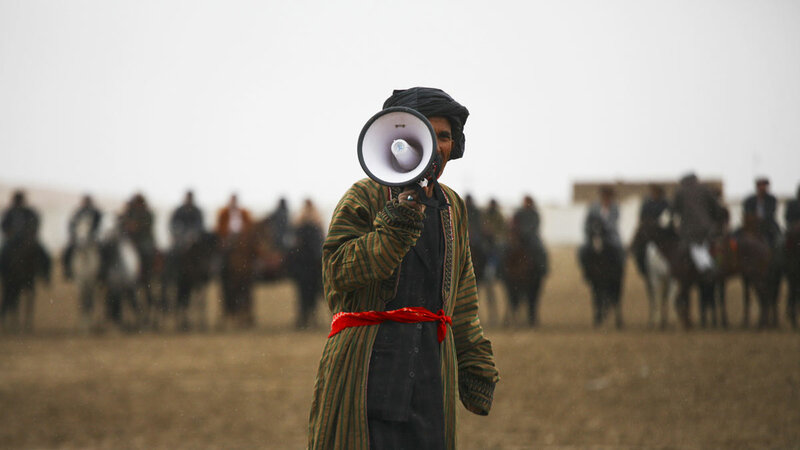 and is now a candidate for vice president in the Afghan election [What again?]. 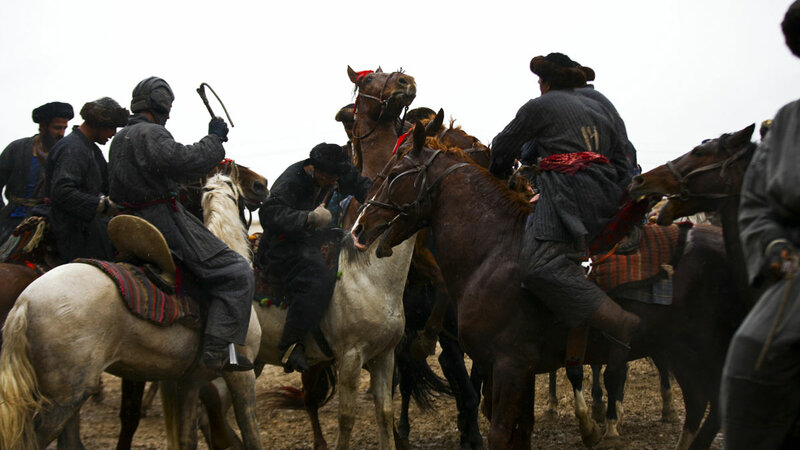 Powerful figures often sponsor buzkashi matches as a sign of their wealth and influence. 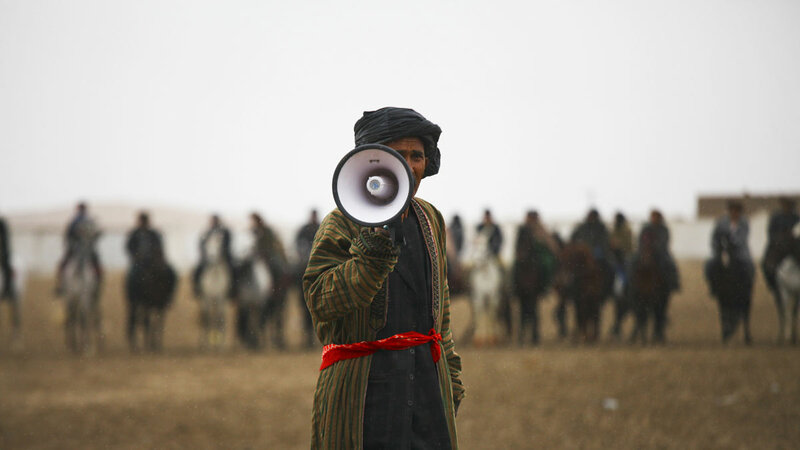 Dostum watched this one on TV, from the comfort of his warm and dry compound. 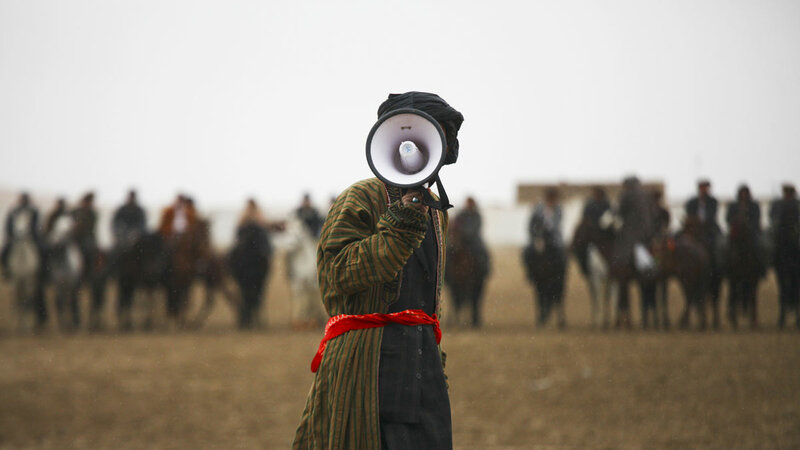 But his son, Bator, showed up in person, wearing a bright, striped chapan, a traditional Central Asian overcoat. 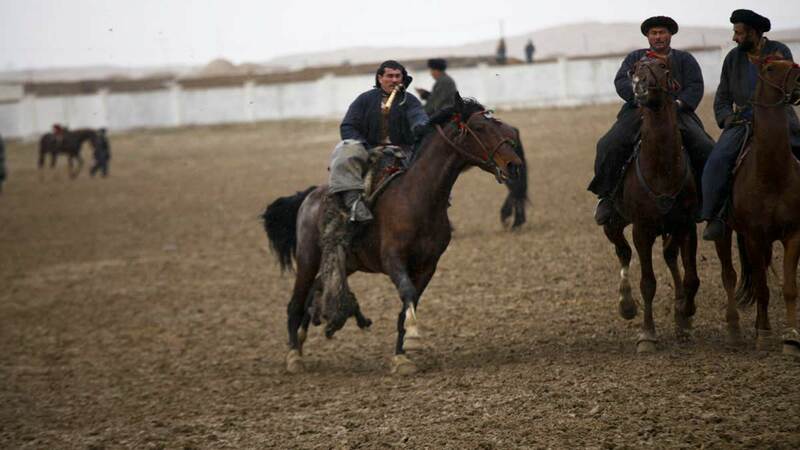 Bator Dostum sits in the center chair of the stadium, the best seat in the house. 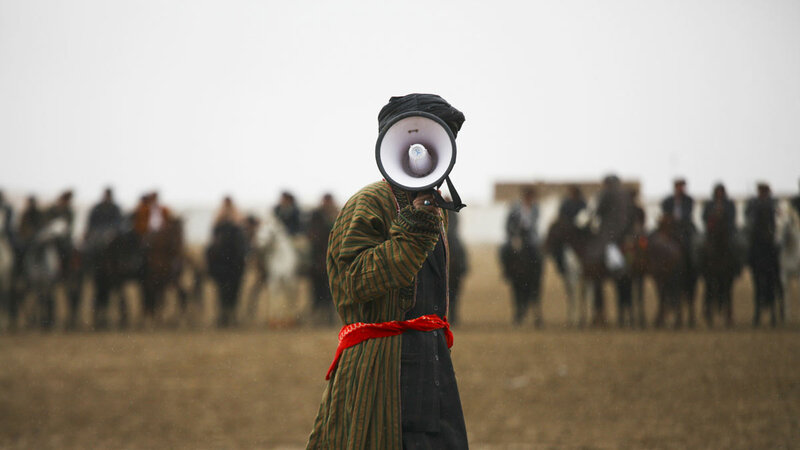 There are signs of 2014 at a buzkashi match: Cars line up by the field, spectators carry cellphones, and the incessant "cheerleaders" never seem to put down their megaphones. 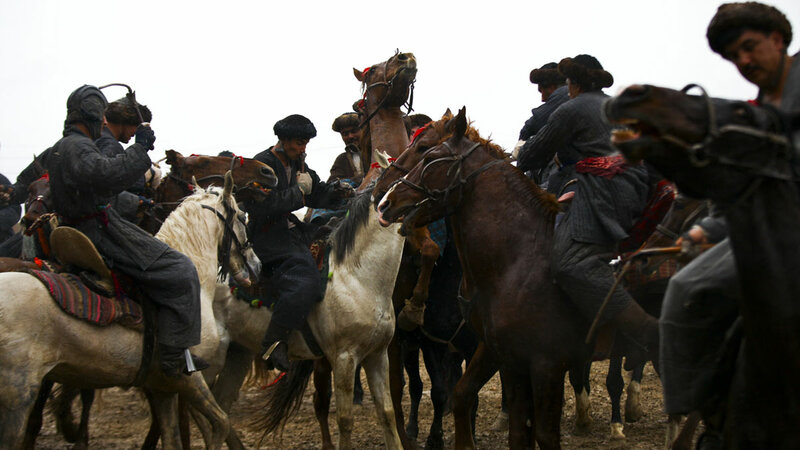 The atmosphere is reminiscent of a rodeo. 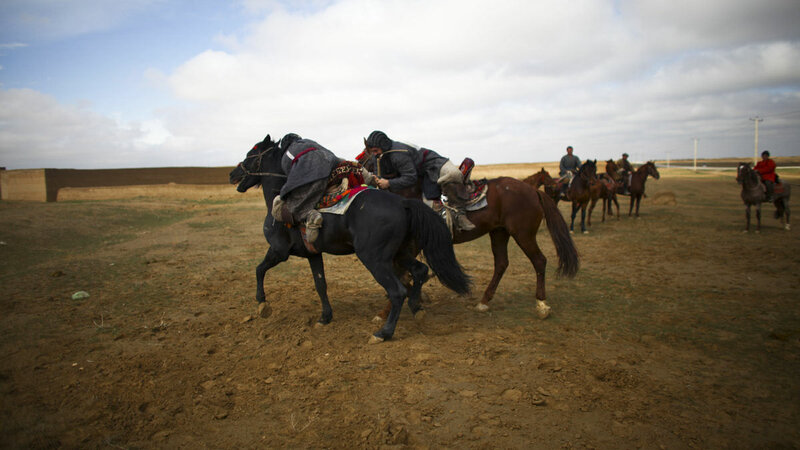 But to Western eyes, the game looks like a time capsule from the days of Genghis Khan, when battle exercises were disguised as sport — fighting on horseback, grabbing the prize, breaking away. 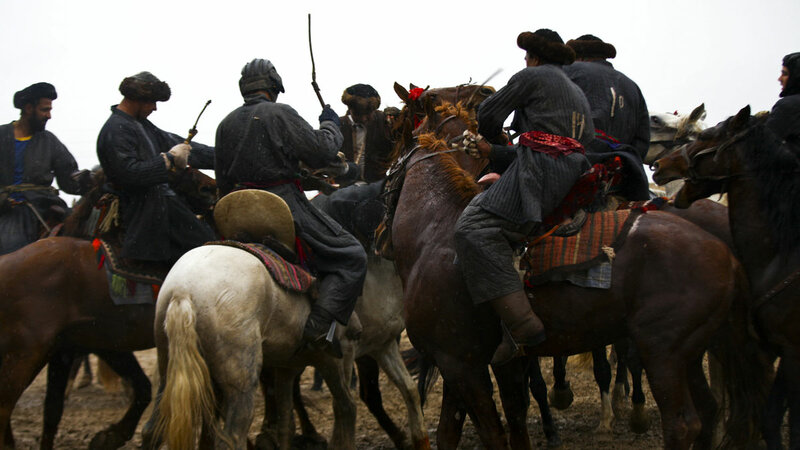 Back then, buzkashi was training for war. 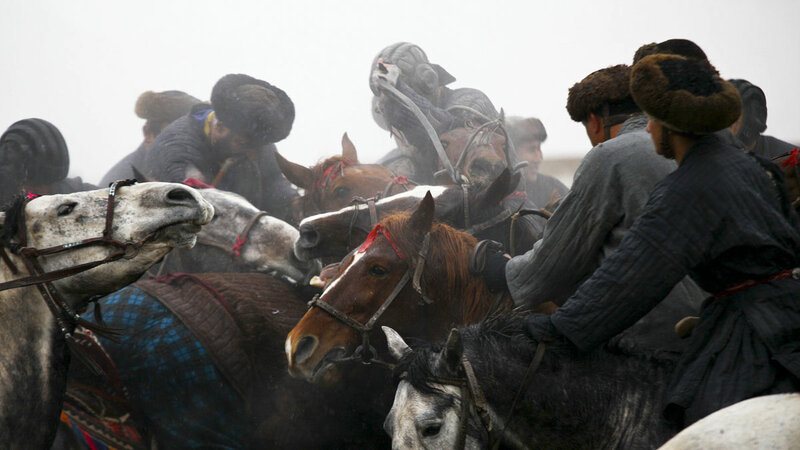 Today, buzkashi itself is the battle. 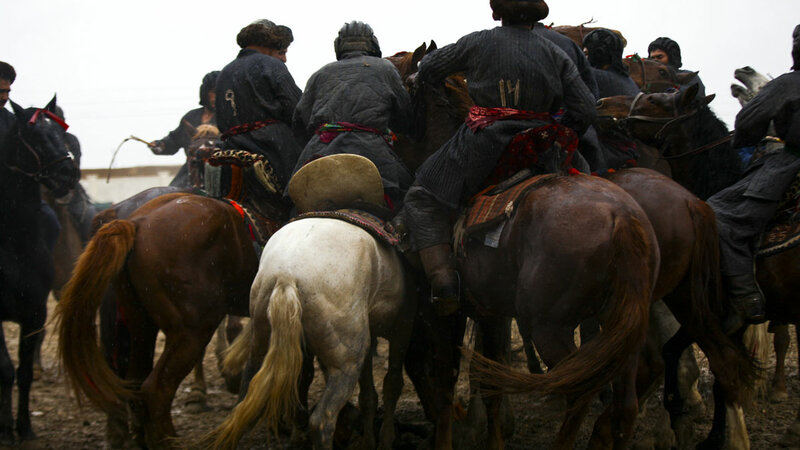 Beyond sport, buzkashi is a ritual, a ceremony — a test of strength, cunning and courage. 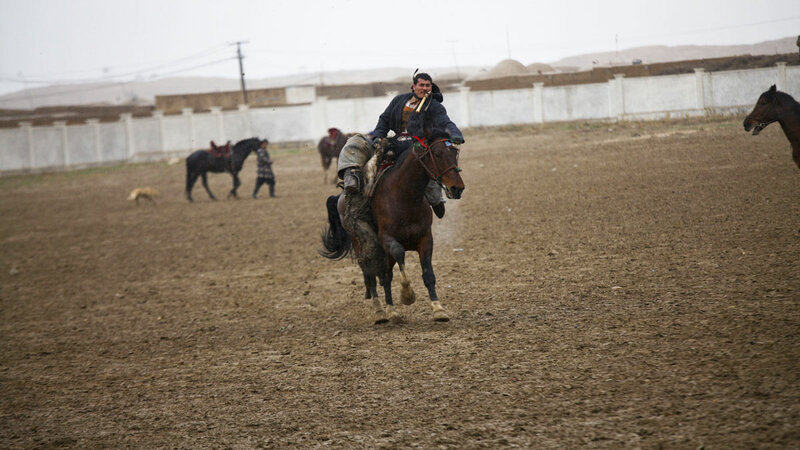 For many young Afghan boys (it is still a man’s sport, on the field and in the stands), growing up to be a champion buzkashi rider, or chapandaz, is the stuff of dreams. The morning of the match, the goat is chosen and slaughtered in halal fashion. 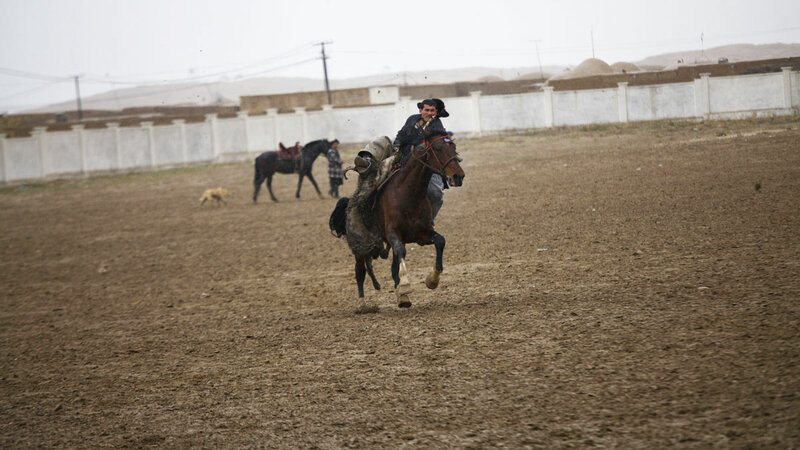 Calves are used in high-level matches because they are heavier — up to 100 pounds. The throat is slit and bleeds out. 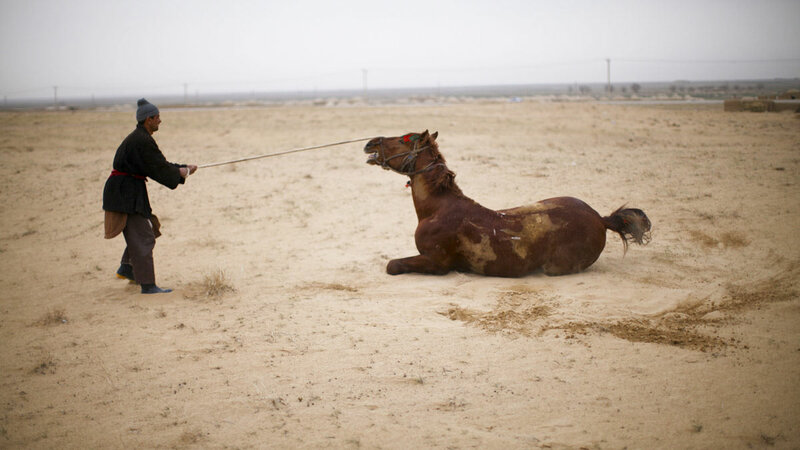 The animal is then decapitated and gutted. 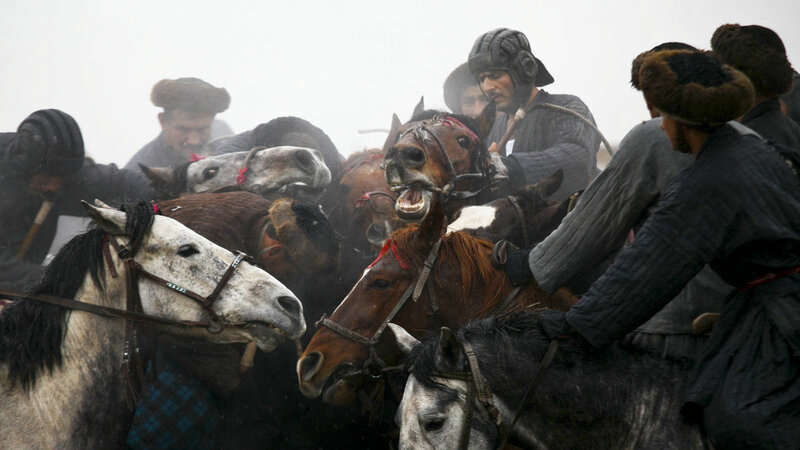 The hooves are cut off. The skin is stitched back together. Game time. 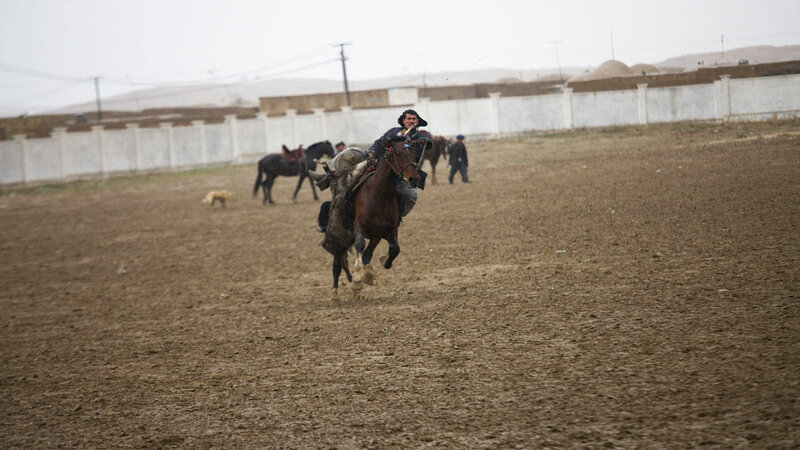 A chapandaz exhibits nearly perfect form: Whip in mouth, he hoists the buz — or ball — under his right leg and steers the horse with his left arm. 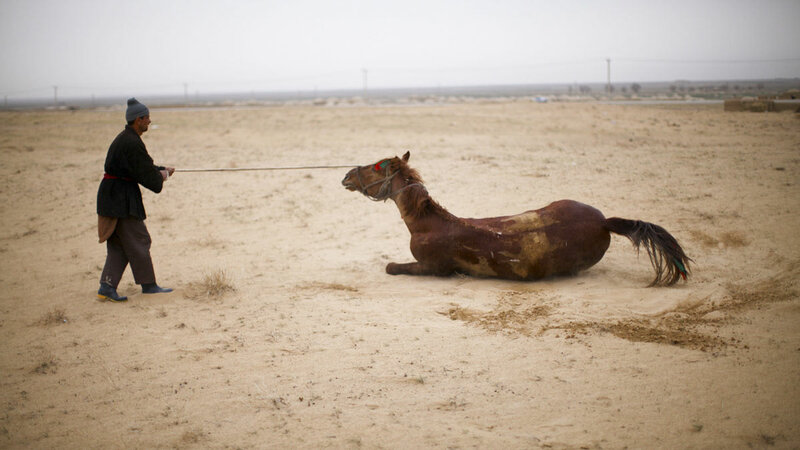 The animal carcass is dropped at one end of the field. 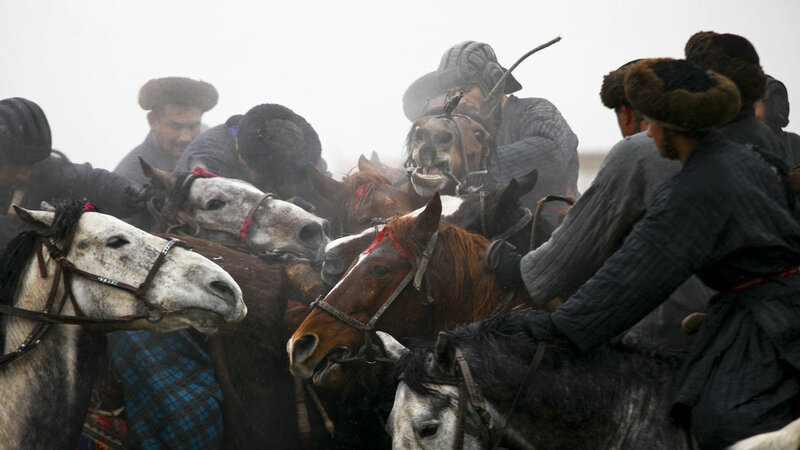 Horses scrum around the carcass as players fight to grab it. 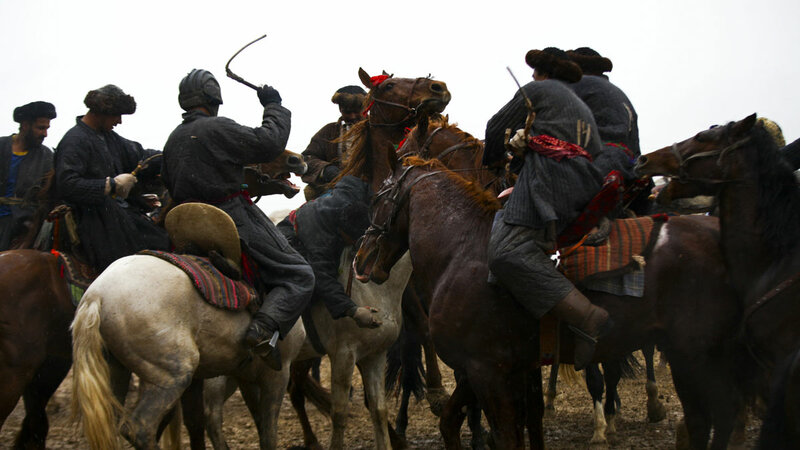 Whoever breaks away with the carcass must carry it around the marker across the field. And then drop the carcass back in the scoring circle. 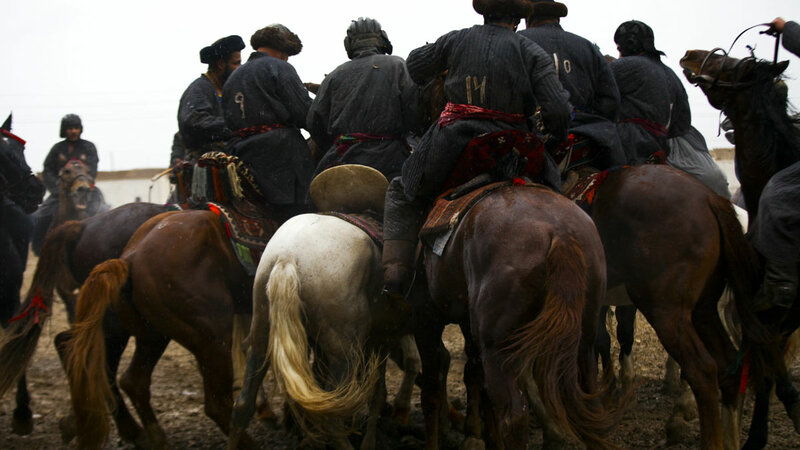 These days, buzkashi horsemen aren't so much warriors as they are professional athletes. 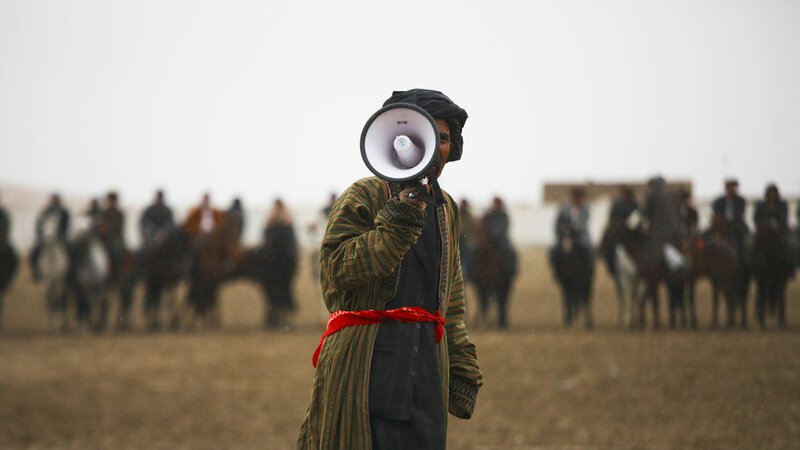 Najibullah (the guy holding the wad of cash) was the star of the game — and like many Afghans goes by only one name. 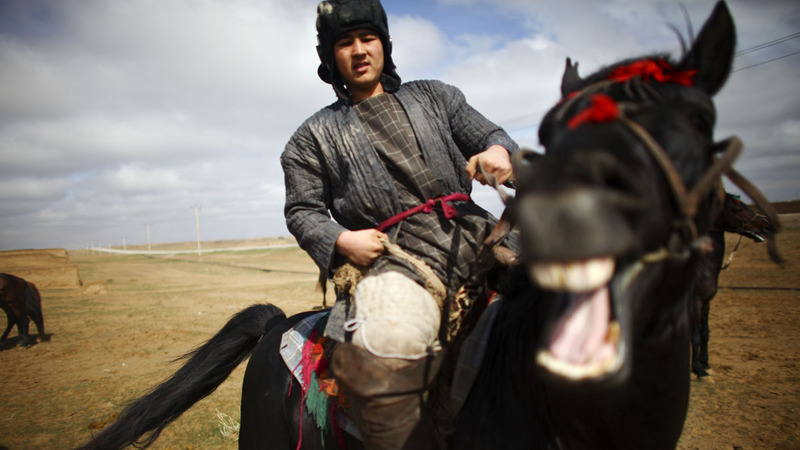 He is almost as famous as his older brother, 36-year-old Jahangir, who is also a wrestler — common among chapandazes. 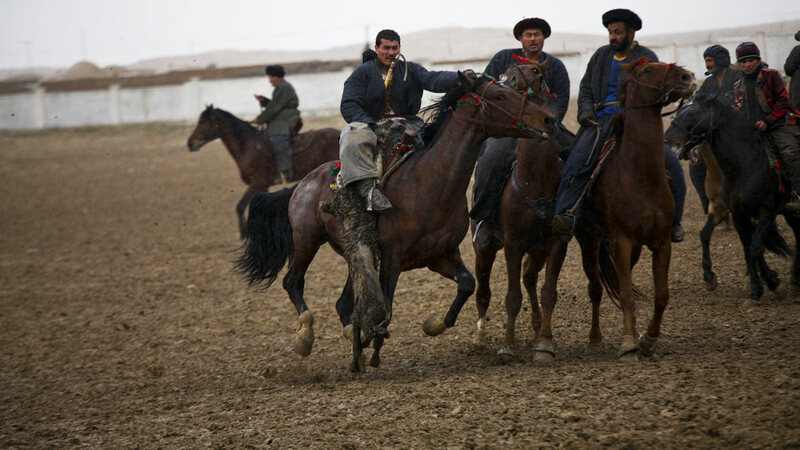 Najibullah (left) and his older brother Jahangir are buzkashi celebrities in Afghanistan, and have won tens of thousands of dollars in prize money. Jahangir gets geared up to play. 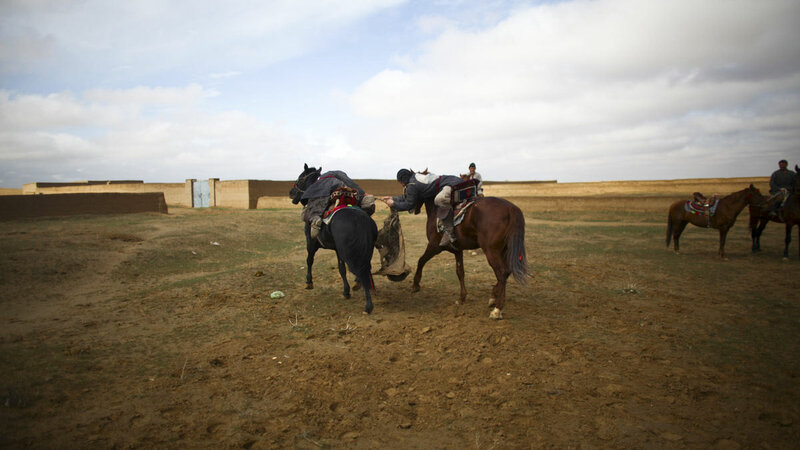 Najibullah and Jahangir are built like brick walls; they spend a lot of time at the gym. 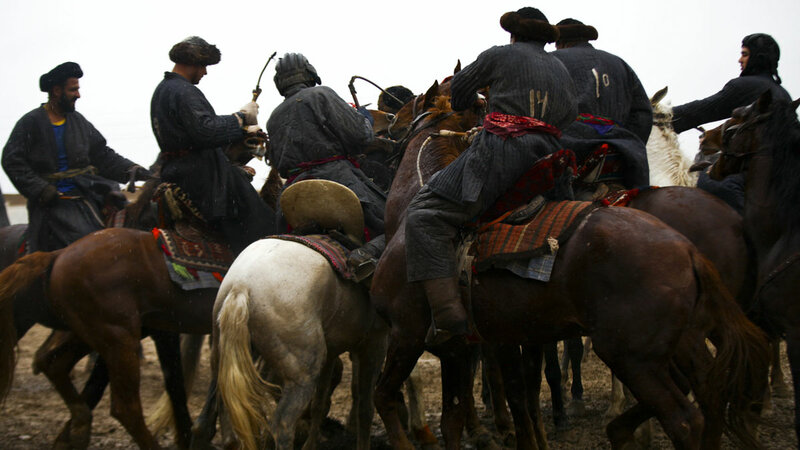 Both got into buzkashi by following in the footsteps of their father and grandfather. Jahangir's 16-year-old son plays, too. He was one of the youngest in the game. 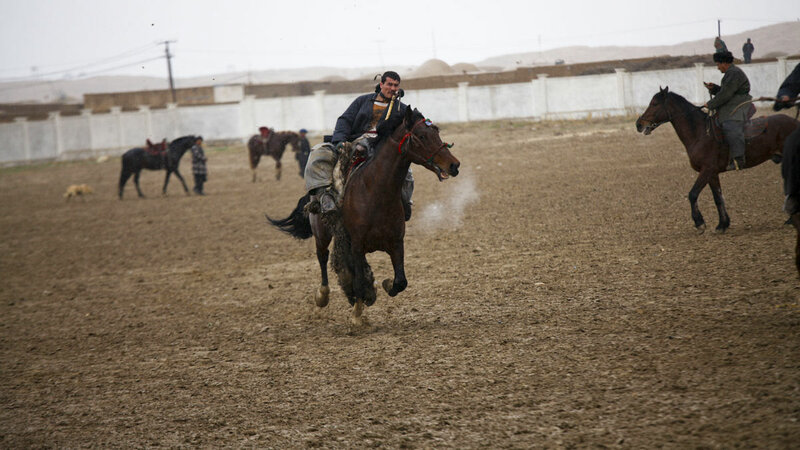 We watched him train one afternoon with his uncle, Najibullah. 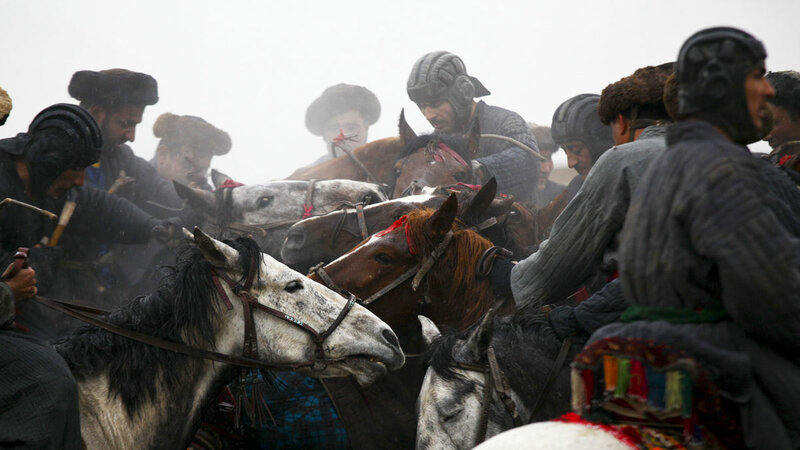 The first task in buzkashi is also the hardest: picking up the animal. 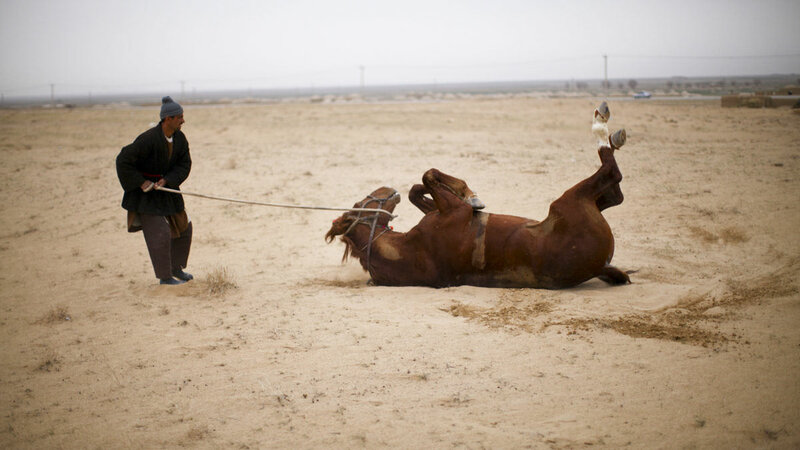 To do it, you put the whip in your mouth, lean over the side of the horse, nearly fall off, pull the muddy, slippery carcass up and under your leg, and ride off. 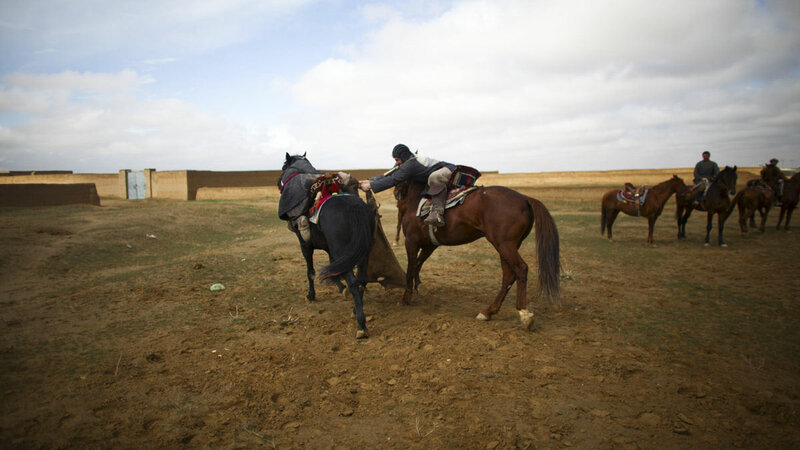 Najibullah and Jahangir explain that sometimes they try to pick up the carcass; other times, they wait for someone else to do the heavy lifting (literally and figuratively) and then steal the buz to complete the goal. 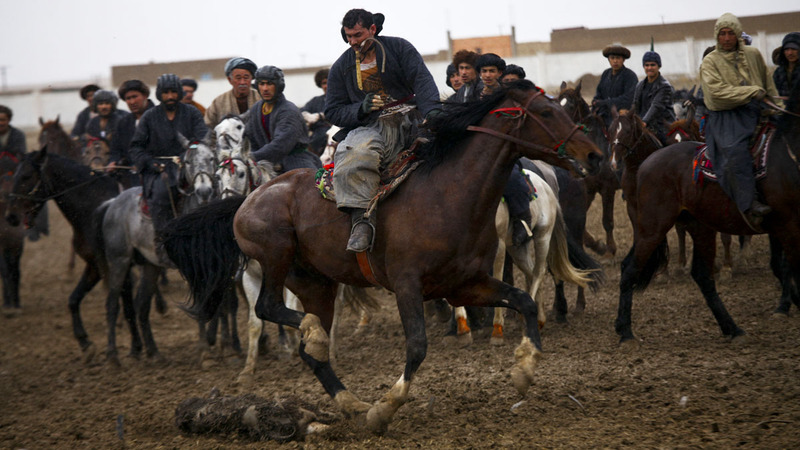 Buzkashi, as it’s played in Sheberghan, is a highly individual sport — though the brothers have no rivalry, they say. 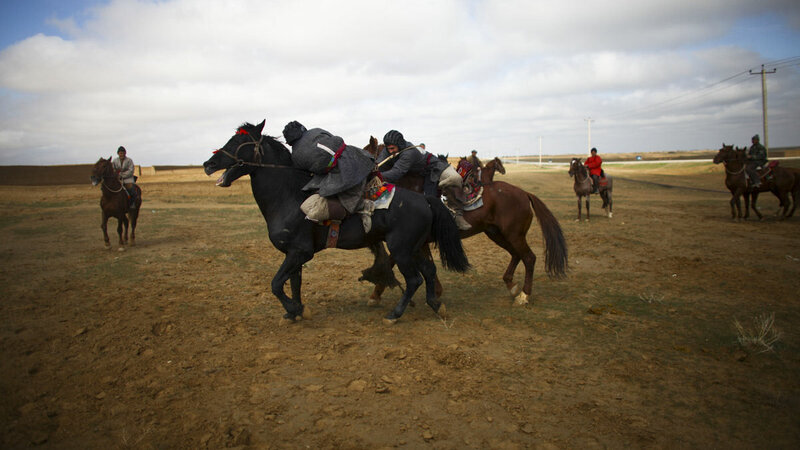 In fact, sometimes they strategize to make sure at least one of them scores. Either way, a win for the family. 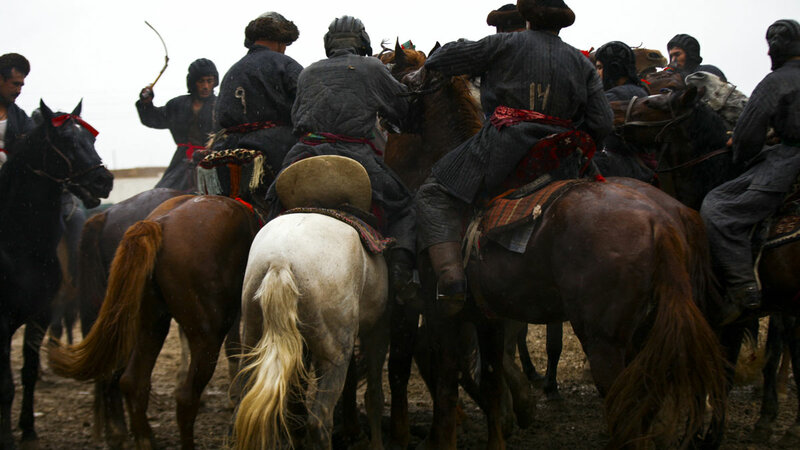 Quick Guide: "Genghis Khan Couture"
Buzkashi horses train just as hard as — if not harder than — the chapandazes and can cost up to $50,000 each. 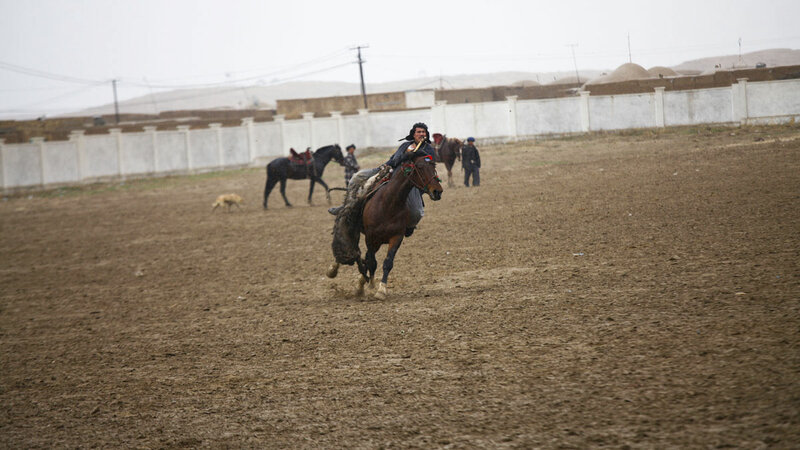 But they're built to last: A healthy buzkashi horse can play for 20 years. 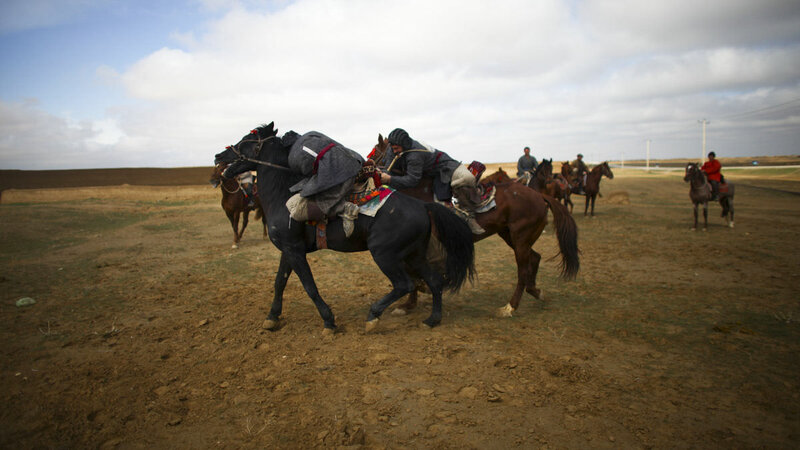 Today, the horses come from Uzbekistan or other Central Asian countries, as Afghanistan lost its capacity to breed champion horses during the decades of war. 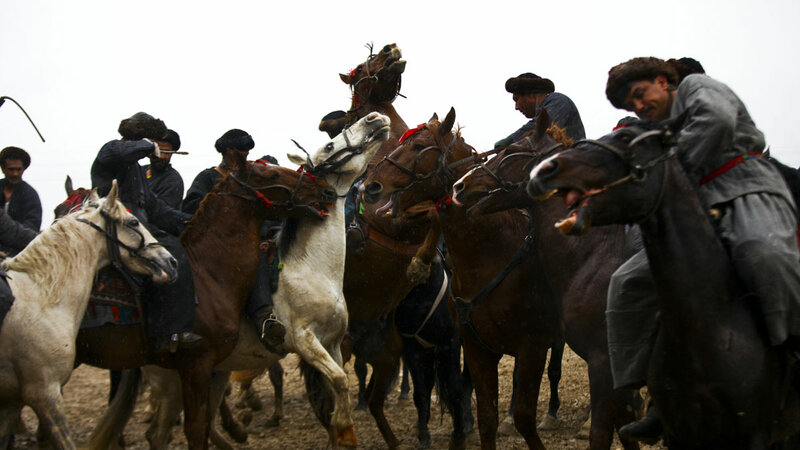 Given the cost, some chapandazes will partner with businessmen or other wealthy patrons. 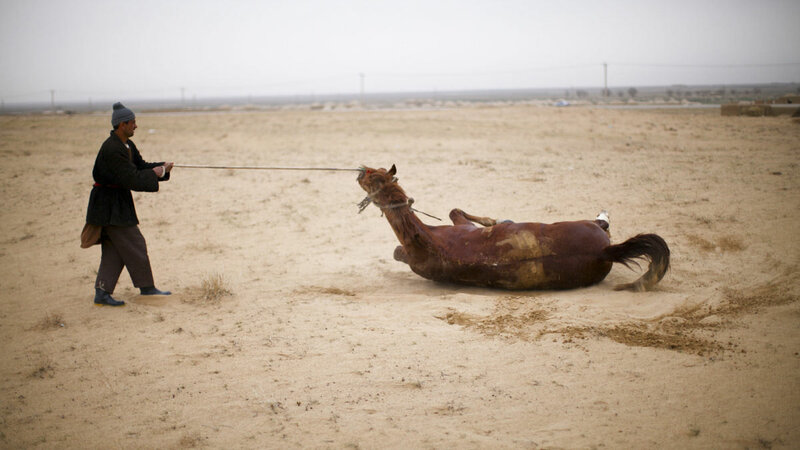 It’s kind of like sponsorship in NASCAR, except the horses aren’t plastered with Exxon or Home Depot stickers. But they are fast. And powerful. The match we saw took place on a cold, rainy and really muddy day. 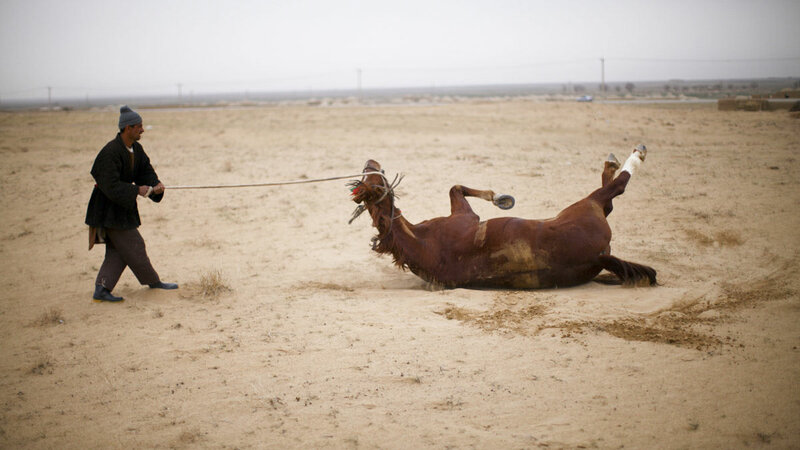 Not ideal spectating weather, but perfect, Jahangir says, for keeping the horses cool. 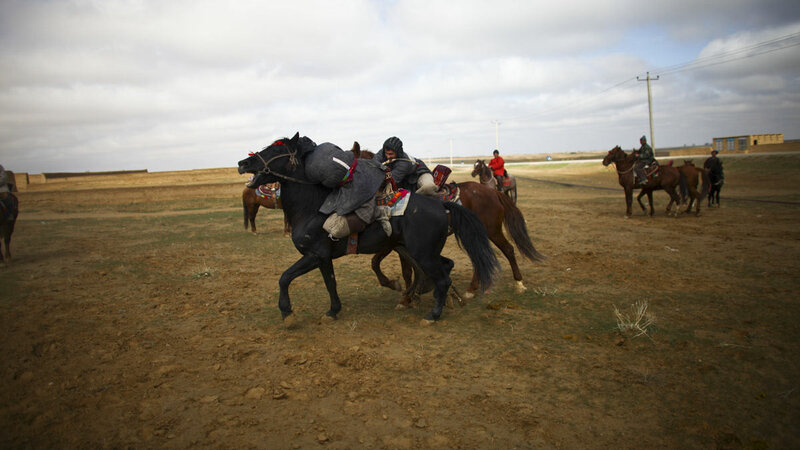 Jahangir and Najibullah each won a few rounds. 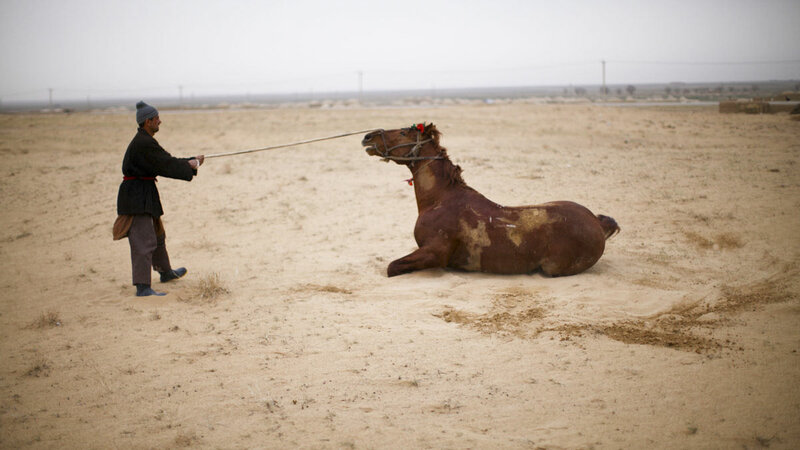 They'd drop the animal, then head to the grandstand for their prize money. Then came the $3,500 final round. 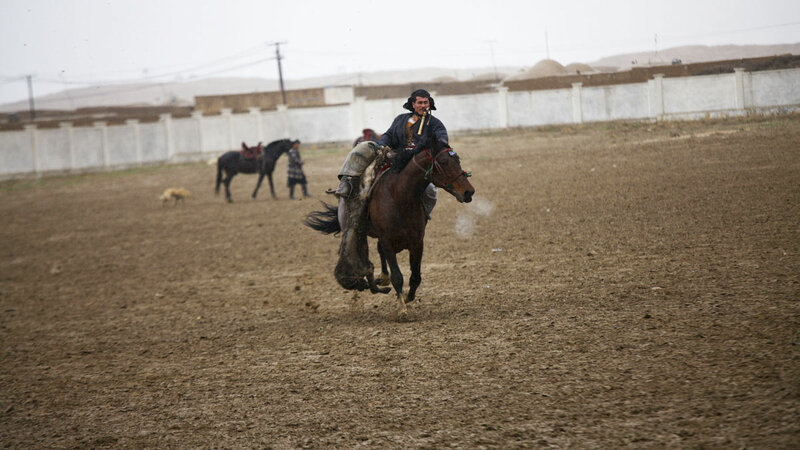 Not much in U.S. sports, but about 10 times the typical monthly wage in Sheberghan. 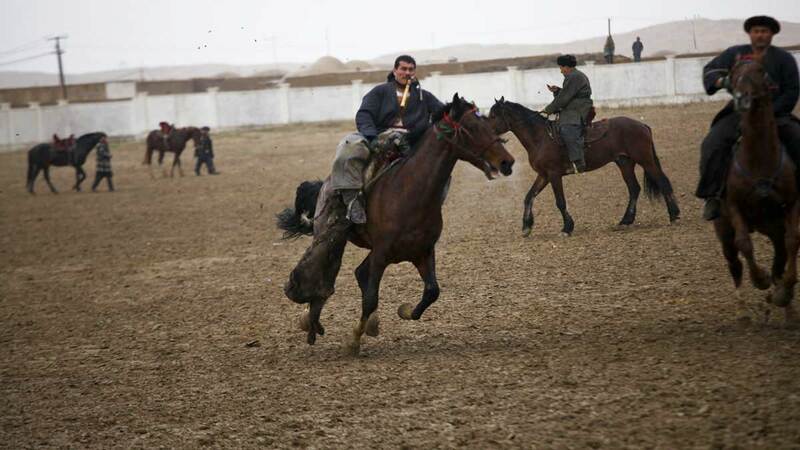 Finally a rider emerged from the scrum, galloped off around the flag, and dropped the mangled calf into the goal. 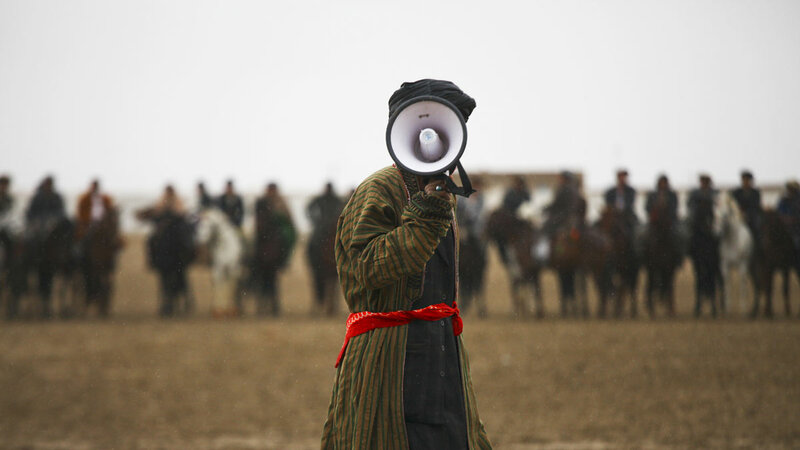 It was Najibullah. 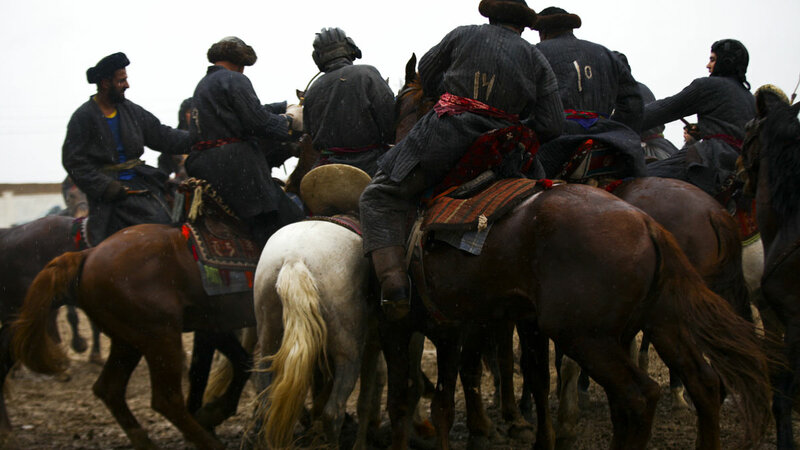 He took a giant handful of cash and rode off — no ceremony, no formal presentation. No concern to the fans — they got everything they had come for. 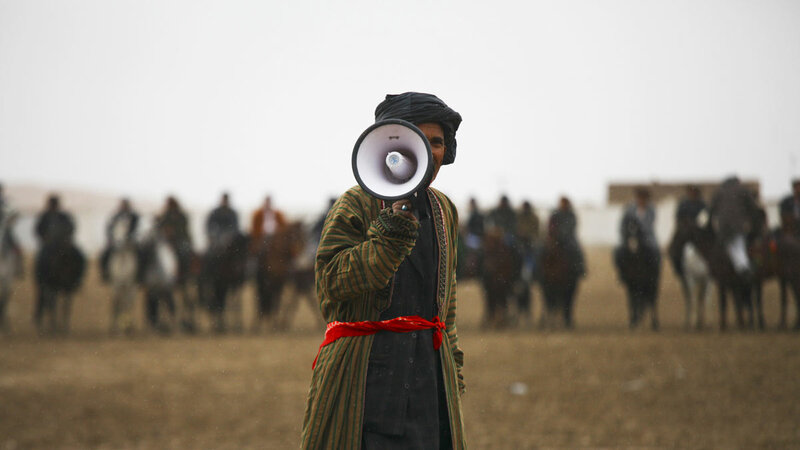 A lot has changed in Afghanistan. 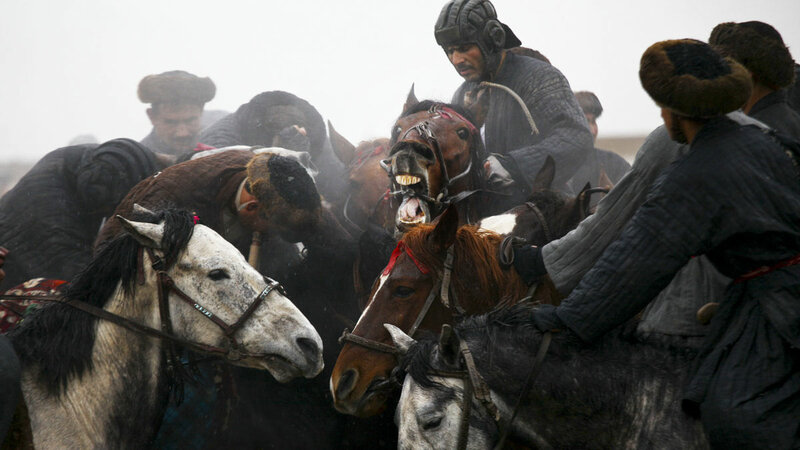 But not buzkashi. At least, not really. 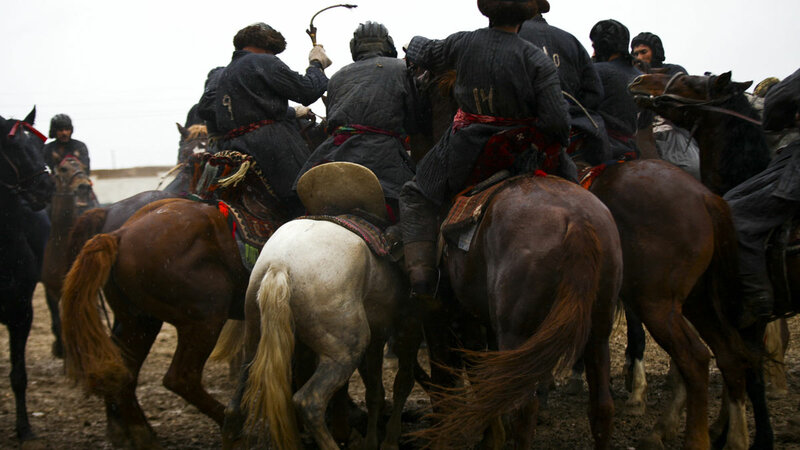 Yet at the end of a grueling two hours, the brothers take their American money, descend from their horses, remove their traditional coats — and drive away in their luxury cars. 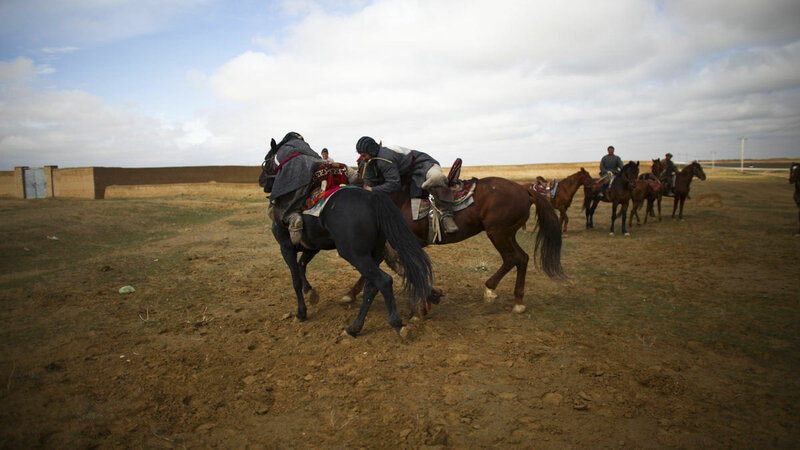 NPR's Sean Carberry goes to a Buzkashi game in Northern Afghanistan. 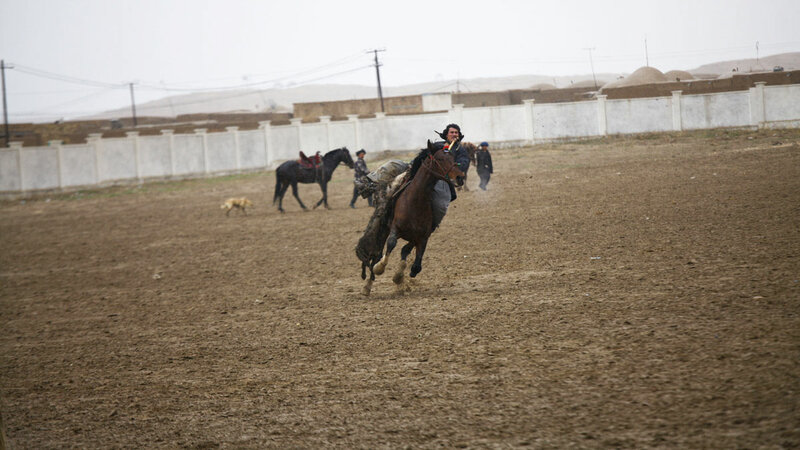 It's a centuries old game, in which men on horses aim to pick up the carcass of a dead calf, carry it across a field, and drop it in a pre-designated circle.